Gluten-free chicken and dumplings swimming in a salty, creamy broth of herbs and aromatic vegetables found its way to our kitchen a few weeks ago. A cold-weather food, good for the changing of the seasons, gluten-free chicken and dumplings can satisfy hungry bellies on chilly autumn evenings – fulfilling the roles of both company food and comfort food in one ladle full of thick stew dripping with wholesome fats and dotted by peas, carrots and celery. A combination of rice, sorghum and tapioca, these gluten-free dumplings are dense, but savory – made even more special by the inclusion of minced fresh herbs: parsley, chives, thyme and celery leaves which are all too often wasted for want of knowledge as to their use. Even for those who don’t need or care to adhere to a gluten-free diet, the inclusion of gluten-free grains and pseudocereals can bring beautiful variation to the supper table, and with that variation in flavor, texture and appearance also comes variation in nutritive value – ensuring that variety in your diet can help to fuel your body better. Quinoa is a good source of folate, magnesium and phosphorus, while rice offers some thiamin and a good deal of manganese. Millet provides some vitamin B6 and manganese, too. Buckwheat, a pseudocereal, is rich in magnesium and the flavonoid rutin; moreover, it’s a very good source of the enzyme phytase making it an excellent addition to gluten-free flour and grain mixes which can otherwise by high in the antinutrients, but relatively low in phytase – the enzyme that, once activated, helps to degrade food phytate rendering grain’s full complement of minerals a little more available to the body. For this reason, I call for soaking the dumpling dough in buttermilk for several hours prior to cooking the stew – preserving old world techniques and maximizing nutritive value where we can. Of course, about twenty to thirty percent of Nourished Kitchen readers avoid gluten-containing grains or grains altogether. Indeed, my family is largely gluten-free and I credit a gluten-free diet with helping my body to not only recover from hyperthyroidism, but also to conceive my son. It was at the direction of my endocrinologist who suggested a gluten-free diet might aid in the recovery from the distress that years of thyroid disease had wrought on my body. Of course, after years of healing my gut through fermented foods, bone broth and other nutrient-dense whole foods, I’m able to tolerate a a small amount of properly prepared cereal grains – a true sourdough, soaked or sprouted breads and flours, just as my naturopath suggested I might. We talked a bit about my history with gluten-free foods on a recent interview for Transform Your Health with Dr. Josh Axe, where I was reminded that while about 1 in 133 people suffer from true celiac disease, about 1 in 7 suffers from gluten intolerance on some level and that gluten intolerance can manifest itself in many ways. So, gluten-free readers, you’re not alone – not by a long shot. And after much begging and pleading in our recent reader survey (you can still weigh in, by the way), I’ve listened and will share more of my tried-and-true nourishing, gluten- and grain-free recipes. Enjoy. 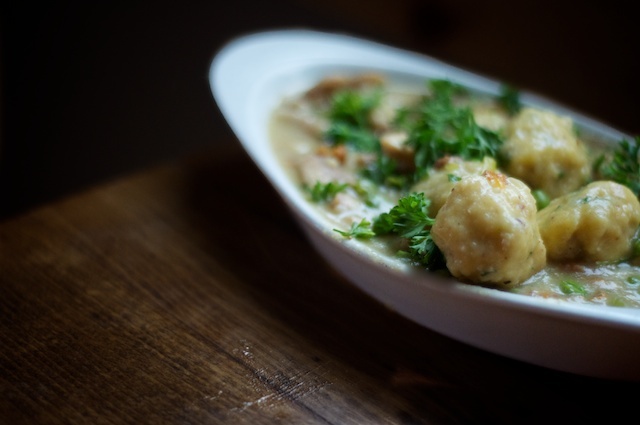 This pot of steaming, creamy stew flecked with fresh herbs, pastured chicken and gluten-free dumplings is for you. Gluten-free chicken and dumplings is rich with broth, fresh herbs and aromatic vegetables, for a bit of variation, consider omitting bacon and adding two cups chopped wild mushrooms – any will do, but I’m particularly fond of chanterelles in this dish. Stir brown rice flour, sorghum flour, almond meal, buckwheat and tapioca flour together, then pour buttermilk into the flour and stir the mixture together until it resembles cornmeal. Set it aside, covered, for about eight hours or overnight. After the dumpling dough has soaked overnight or about eight hours in buttermilk, mix remaining ingredients into the dough and form the dough by hand into balls about one-half to thee-quarters inch in diameter. Set them aside while you prepare the remaining ingredients. Melt two tablespoons butter in a heavy-bottomed soup pot, then add four ounces chopped bacon to the pot and cook it through. Remove the bacon from the pot and set it aside. Toss chopped onion, celery and carrots into the pot and cook them until they become tender and fragrant, then add chopped chicken to the pot and cook for three to five minutes. Pour in 1½ to 2 quarts fresh chicken broth into the pot and simmer the soup for ten minutes, covered. Reduce the heat to medium-low, uncover the soup pot, add 1 cup fresh or frozen English peas into the soup and drop formed dumplings, no more than three-quarters inch in diameter, into the pot. Cover the pot again and allow the dumplings to cook undisturbed for eight to ten minutes. After eight to ten minutes, uncover the pot and stir in fresh minced herbs and reserved bacon. I was just enjoying my homemade gf spanakopita thinking I need to find a good gf chicken and dumplings recipe, when I stumbled across this recipe on Pinterest. Although I’ve been following you for a few months ago, I haven’t delved too deeply into the archives — my little one hates it when I’m on the computer. I’ll definitely have to check out your archives to see what other good recipes I’m missing out on! can i just leave out the almond meal, or is there a good, nut-free substitute? I’m curious, what is your opinion about the wisdom of staying away from celery leaves, as they contain toxins? I think it’s ridiculous and unfounded. Can I omit the buttermilk? I can do anything that is dairy free, soy, rice, almond. I live in France and buttermilk is hard to come by here. Is there a good substitute? Mixing yogurt into raw milk? Thanks for any advice! Curious if you could recommend possible solution to make the dumplings egg free, nut free, & dairy free?